There are significant changes/enhancements to the ABLE account for 2018. We have summarized the changes based upon information from the National Disability Institute's excellent ABLE National Resource Center. 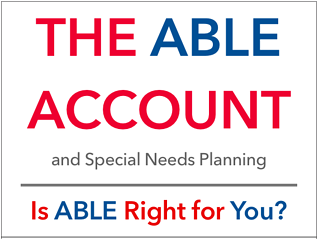 To learn the basics about ABLE, check out our ABLE Accounts: Ten Things You Need to Know , adopted from the The ABLE National Resource Center. ABLE to Work- additional allowable contributions by the beneficiary as a result of employment. Savers Credit - Access to the Retirement Savings Contribution Credit. 1. Increased Annual Contribution Limit - The annual contribution limit is periodically adjusted by Congress for inflation. For the 2018 tax year, the annual limit is $15,000. Since an ABLE account may have many individuals depositing money into the account, it is important for the account holder to be sure the total of all contributions from all sources does not exceed $15,000. in one year. 2. ABLE to Work- The ABLE to Work provision was passed by Congress as part of the Tax Cuts and Jobs Act of 2017. It is currently set to expire on January 1, 2026. This provision allows an ABLE account beneficiary who works and earns income to contribute funds above the $15,000 annual limit. Example: Sheila, an ABLE owner has a job and makes $13,000. She does not participate in her employer's retirement plan. Although her parents have put $15,000 into her ABLE account in 2018, Sheila can contribute an additional $12,060 of HER OWN MONEY into her ABLE account. 3. 529 Fund Rollovers- This provision allows funds in a 529 College Savings account to be rolled over into a 529A(ABLE) account. It is currently set to expire on January 1, 2026. The rollover funds are subject to the annual contribution limit of $15,000 for any given tax year, given that no other contributions have been made into the account that year. Example: Max, a teenage child just received a diagnosis of autism. When he was born his parents started a college savings fund (529) for him but now it is not known whether he will go to college or not. An ABLE account may be opened for Max, assuming he meets the criteria, and his parents may now roll over the 529 to an ABLE account without any penalties or taxes due on earnings. 4. Saver's Credit- also known as the Retirement Savings Contributions Credit, was designed to provide an incentive for low and middle income individuals to save. It is currently set to expire on January 1, 2026. Example: You are an ABLE owner working and making $20,000. You have put $2000 into your ABLE account this year. You can take a credit of 50% of your contribution, equal to $1000 in this case, to reduce your tax liability. If possible, you can use this $1000 to contribute further to your savings. For further information, please contact us or visit the ABLE National Resource Center. Content in this material is for general information only and not intended to provide specific advice or recommendations for any individual, nor intended to be a substitute for specific individualized tax or legal advice. We suggest that you discuss your specific situation with a qualified tax or legal advisor. 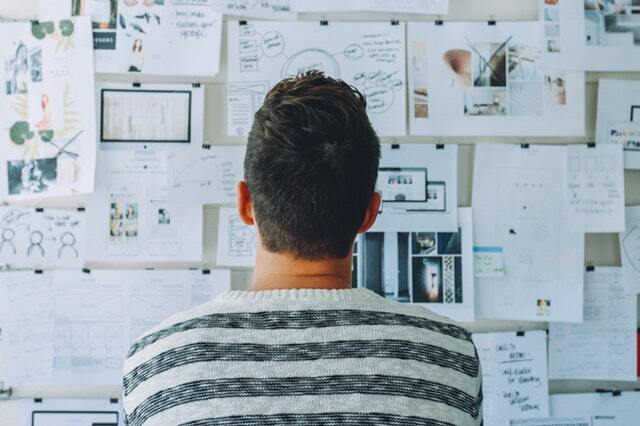 [ add line space ] Prior to investing in an ABLE account investors should consider whether the investor's or designated beneficiary's home state offers any state tax or other benefits that are only available for investments in such state's ABLE program. Withdrawals used for qualified disability expenses are federally tax free. Tax treatment at the state level may vary. Investing involves risk including loss of principal. No strategy assures success or protects against loss. The ABLE account provides grandparents with the opportunity to gift to their grandchild with a disability in the same manner as they contribute to their typical grandchild's 529 account. Many grandparents want to treat all of their grandchildren equally and using an ABLE account as a savings vehicle for gifting may help. Our client has a strong belief in higher education and set the goal of establishing educational accounts for all of their grandchildren soon after they are born. They have just celebrated the arrival of their third grandchild. However, this beautiful baby boy was born prematurely and with significant health issues which will likely cause developmental delays. It is already known that his hearing has meaningful, and perhaps total, impairment. An individual can only own one ABLE account. In this case, if the grandparents opened an ABLE account for their grandson, the parents or the other grandparents would NOT be able to open a separate ABLE account for him. They are allowed up to the $15,000 contribution limit (2018) to fund the ABLE account. If the balance in the ABLE account exceeds $100,000, the individual's Supplemental Security Income (SSI) eligibility is impacted. Another option is to gift the funds directly to the parents and have them specifically earmarked for the benefit of the child. Should the grandparents have financial wealth, they may want to explore the option of creating a Supplemental Needs Trust and purchasing life insurance on their lives to fund it upon their death(s). These are only a few common strategies we discuss with families. There are various strategies and considerations the grandparents can explore with their team of advisors to determine the most appropriate option to gift to their grandchild with special needs. The ABLE is a great tool to help keep a balance below $2,000 in a Representative Payee (or an Individual's) checking account. A representative payee helps beneficiaries who need assistance in managing their social security benefits. Our client called and was very distressed that she had lost her son’s SSI income due to having more than $2,000 in his representative payee account. In the past, our first go-to would have been to think creatively about items or services their adult child could both benefit from and pay for. This would allow the parents to save their resources for their family’s goals. If the account continued to increase we would then suggest a “spend down” of the account to maintain eligibility for social security benefits. In this case, we asked if there was anything he needed that she could spend the extra money on? She had already purchased a new computer for him as well as some new winter clothes. He really did not need much of anything else. She could put the additional money into his already established and funded first party supplemental needs trust. However, this was money he had inherited from his grandparents and she considered the SSI benefits “his money”. So another option to be considered would be the ABLE Account, which would allow for contributions of excess funds above the $2000 threshold in the representative savings account. The new ABLE account savings option allows contributions up to $15,000/year into the account, to be used for the beneficiary's short term needs or invested for longer term needs. As long as the account, housed in Massachusetts, remains under $100,000 her son’s benefits will not be impacted. When reviewing the investment options, we reminded her to carefully read all the materials should she choose the ABLE Account, and to choose the best investment for the beneficiary of the account: her child. The ABLE Account is available in several states currently and is due to be offered in Massachusetts next month. Here are a few resources to help you learn about the ABLE account and whether it is right for you or your family member with a disability. To learn about the basics of the ABLE account, click here to read ABLE Accounts: Ten Things You Need to Know. Click here for a chart, provided by the National Down Syndrome Society comparing elements of all of the currently operable ABLE programs in the U.S., along with their contact information. When the child turns 18, transferring money to an ABLE account can help avoid the spend-down process - reducing savings beneath the $2,000 threshold. Gainfully employed persons with a disability may open an account to save their own money. An ABLE account may be used to address the issue of staying below $2000 in a Representative Payee Account. There are potential planning strategies around allowing distributions for housing related expenses. Currently, special needs trusts do not permit distributions for housing; only supplemental expenses. * We borrowed your great title! The title Finally ABLE to Save: A New Savings Tool for People with Disabilities is from a presentation by Heather Sachs, JD, Vice President of Advocacy & Public Policy, National Down Syndrome Society. Thanks, Heather! Attendees included (partial list L to R): Teresea Hayes, Maine State Treasurer; Tom Graff, MEFA; John Nadworny, MA Down Syndrome Congress; Chris Rodriguez, National Disability Institute; Bill Dwyer, New Hampshire Sate Treasurer; Beth Pearce, Vermont State Treasurer. 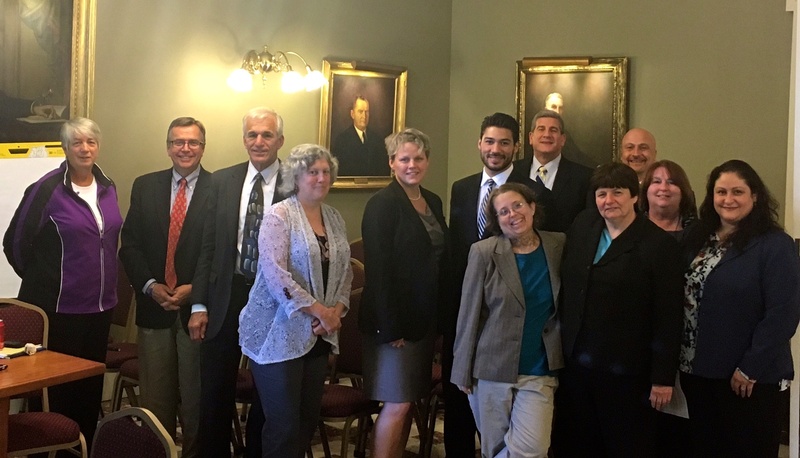 Earlier this month, John Nadworny attended a meeting of State Treasurers and representatives from the 6 New England states, (MA, ME, VT, CN, RI, NH) to discuss the possibility of forming a consortium to offer the ABLE account to their constituents. This meeting was a first step toward crafting a platform for regional collaboration, as the New England states with smaller populations are concerned with achieving the critical mass necessary to effectively administer a program on their own. The consortium approach involves one state taking the lead and working together with the other states to develop a program that would provide meaningful benefits to the families in their state. Collaboration on the ABLE account is occurring in other areas in the country as well. On June 1st, Ohio became the first state to enact their “STABLE account” program. Ohio’s national program offers benefits to individuals with disabilities in Ohio and across the country. The program allows for out of state individuals to hold accounts in Ohio for slightly higher fees without risking their eligibility for federally-funded means tested benefits. For the first time, individuals living with a disability can save more than $2,000. while maintaining their current benefits such as social security, medicaid, and other publicly funded programs. Tennessee was quick to follow Ohio’s lead on June 14th putting their own national program (ABLE TN) into place. Tennessee’s program is nearly identical with slight differences coming in it’s fee structure. Currently ABLE TN and the STABLE Account are the only two states enrolling beneficiaries, however others are expected to follow soon. Nebraska and Florida are the closest to launching programs currently, with Nebraska offering like benefits to ABLE TN and the STABLE Account, and Florida offering an in state only program. Prior to investing in a ABLE account investors should consider whether the investor's or designated beneficiary's home state offers any state tax or other benefits that are only available for investments in such state's ABLE program. Withdrawals used for qualified expenses are federally tax free. Tax treatment at the state level may vary. Please consult with your tax advisor before investing.Investors should consider the investment objectives, risks, charges and expenses associated with the ABLE account carefully before investing. The issuer's official statement contains this and other information about the investment. You can obtain an official statement from the state's ABLE program administrator. Read carefully before investing.